We arrive at SFO (San Francisco International Airport) for our flight to Santiago, Chile. It's surprising to find very light traffic and light crowd at the airport day after Thanksgiving. Since I have plenty of time to burn, I thought I would try liveblogging and liveblog my way to the Patagonian Frontiers and test the limits of the internet. The Patagonia region is shared by two countries - Chile and Argentina. There should be access to the internet (weefee) at small towns in Chile and Argentina like El Calafate. We'll see how far I can liveblog as we go farther down south and the remote areas. 11:40am. San Francisco, Ca. - Flying from SFO to Miami., Florida. Boarding in 30 minutes. It will be a 5.30 hours flight to Miami. Dead battery on both iPhone and iPad stopped me from liveblogging. Now I'm back with batteries all fully charged. After an 8-hr flight from Miami to Santiago, spent 2+ hours at customs trying to get visa/entry into Chile. We then took 1 1/2 hr bus ride to Val Paraiso where we embarked on the ship. Dec 1, Sunday 1:17pm We're pretty much settled into our cabin, our home for the next three weeks, but still recovering from the long flight. 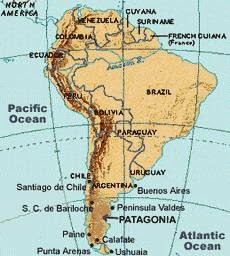 We're sailing from Valparaiso to Puerto Montt (the beginning of the Patagonia region), then South of the Argentine region to the famous waterways of the Strait of Magellan, Beagle Channel and Drake Passage. Our ship will dock in Punta Arenas, we'll then fly into the depths of Patagonia: Torres del Paine National Park. I'm really excited for our expedition to Torres del Paine National Park. I can't wait! Today was very windy. We're supposed to tender from the ship to go offshore, but it's so windy. Instead of having tenders from both sides of the ship, the tenders are only allowed from one side of the ship. Needless to say everybody is late for their excursions. Then on to a long bus ride (90-minutes) including a ride around the Llanquihue, the 2nd largest lake in South America (2nd only to Lake Titicaca in Peru. I'm surprised how green it was. Looming over the lake is the Osorno volcano. German influence is evident in their houses which are made of shingles.